Heavenly blog! : No. 1625: Gustav Adolph Lammers, Norway's "forgotten" apostle who "redeemed" Hans Nielsen Hauge, who lived just before Lammers! No. 1625: Gustav Adolph Lammers, Norway's "forgotten" apostle who "redeemed" Hans Nielsen Hauge, who lived just before Lammers! Gustav Adolph Lammers, Norway's "forgotten" apostle who "redeemed" Hans Nielsen Hauge, who lived just before Lammers!Gustav Adolph Lammers actually has a lot of similarities with me. He, like me, Danish father and Norwegian Mother, had a really good combination.Picture of Gustav Adolph Lammers. 2 Tim. 2. 1. Then you, my son, be strong by the grace of Christ Jesus, 2 and what you have heard of me in the presence of many witnesses, surrender it to faithful people who are also able to teach others! 3 suffer evil with me as a good man of Christ Jesus!1 Cor. 12. 28 And God put in the church first the apostles, the second prophets, the third teachers, the mighty works, the gifts to heal, to help to rule, different kinds of tongues. 29a Are you all apostles?God has undoubtedly raised apostles before our time, even here in Norway.It says in the scripture: "God first put in the church some apostles".I think we can say that more who have gone before us have been apostles. To name a few as Hans Nielsen Hauge, Gustav Adolph Lammers, Erik Andersen Nordquelle, Thomas Ball Barratt, Aage Samuelsen and others.At the same time, I believe that we who are preachers of God's Word have "a little" of all the services in us that God can "bring" into us and it can come to fruition.This I write about here, among other things. http://blog.janchristensen.net/2010/10/nr-22.htmlBut then one has the positive side, God will guide us through revelation. And without revelation, one gets lost. Therefore, both the prophetic gift and the Prophetic service are of great importance and importance.How do these gifts work?The prophetic gift works by the Spirit of God, which communicates to a spirit-filled person who is open and able to be used by God and who desires and wants to be used by the Lord.1 Cor. 12. 4 There are various mercies, but the Spirit is the same. 5 There are different services, but the Lord is the same. 6 There are different powerful effects, but God is the same, He who works all in all. 7 In each one, the Spirit makes itself known so that it is useful. 11 All this works the same Spirit, which divides its gifts to each individual, as he wishes.As for the prophetic service, we read in Ephesus. 4 that the Prophetic service is one of five different ministries given to the congregation.My view of this is that a person who has a cold to work for God who does not necessarily proclaim is a pure Prophet but has part of the Prophetic service as part of his equipment. Some very much others almost not. under the influence of S. Kierkegaards Moment, he cuts his job 1856. Lammers reported himself out of the state church. 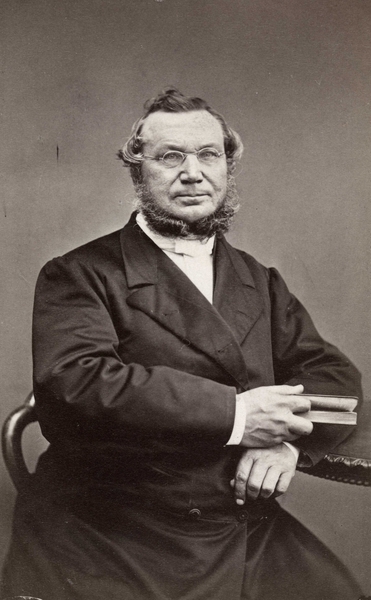 He then founded the Free Church "The Free Apostolic Christian Church", which soon became a publisher elsewhere in the country, including in Kristiansand, where the local "The Free Apostolic Christian Church" gained a rather short-lived existence from 1862 to 1874.Andreas Hauge, the son of the more famous Hans Nielsen Hauge, then took over as a parish priest in Skien.Lammers had a short stay in the church, returning to the state church in 1860. Drawing skills and artistic interests gained more space in Lammer's life after this. He also publishes several salmon collections, including Christian Psalm Book (Skien 1852). He rests on Lie Cemetery in Skien.Final Comment:As said, the apostle breaks new lands and abilities to open doors where no one else has done it. Lammers was one of the ability to open up for free business without passing the state church.Apostle means "sending / sending out". The word comes from the Greek word apostolos (απόστολος) meaning "one that is transmitted".The word implies that one has been sent by proxy and acts with authority on behalf of the one who sent one.Paul is talking about making an apostle's sign. In other words, it is somewhat supernatural and especially that accompanies an apostle.2 Cor. 12. 12 An apostle's sign was done among you with all perseverance, both with signs and under and powerful works.There is something special and supernatural that comes with an Apostle. 'As well, he has a call for a special deed and task.See here from my Bible commentary Galatians 2. 8 For he who by his power made Peter an apostle for the circumcision, he likewise made me an apostle for the uncircumcised.It was the same God and Lord who had called them both. They stood in an equal relationship with each other and thus complemented each other. I do not think Peter was disobedient, but the task needed to be shared. Therefore Paul became the Apostle of the Heath and Peter the Jews.